If you’re still working like a dog to keep Fido full during the day, try your hand at this DIY dog bowl stand to curb your canine’s cravings and reclaim your closet space. Pet parents know that there isn’t ever a great place to store bulky bags of dry kibble. Closets are typically already too cramped to fit a food supply, and the dry food’s smell could attract an infestation of rodents out in the garage where it may go unnoticed—not to mention wastes energy hauling the heavy bag to and from the bowl. Fortunately for space-starved pet owners, home improvement guru Glen has just the thing to take the frenzy out of feeding time. 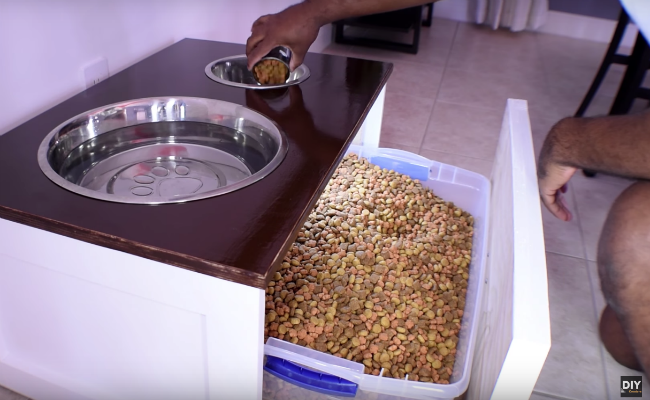 The part-time vlogger and full-time home automation systems designer translated his passion for home improvement to the small screen with his dual-purpose DIY dog feeding station that combines the storage and serving bowls into one compact cabinet. Using only plywood, a drawer track, and an underbed storage container, you can recreate Glen’s results at home to restore order to dinner time. For the frame of the dog feeding station, Glen cut a single plywood sheet into the panels for the back, sides, top, and bottom—all just large enough to accommodate the underbed storage bin of kibble that will go inside—and assembled them into an open-front box using a power drill and screws. Rather than attaching the front panel to the box itself, it connects to a drawer slide that glides along tracks installed in the cabinet interior. Give the front a tug, and it pulls forward to expose the secret stash of dog food ready to replenish the bowls at meal time. Thanks to the depth needed in food storage drawer, food and water bowls (which were dropped into cutouts made in the top of the DIY dog feeder using a jigsaw) are now at the perfect height for medium- to large-sized dogs to chow down around the clock. But, cat owners, take heart: You can make shorter cuts to make the feeder feline-friendly, too! As a result, it’ll just have a smaller drawer for food storage. Glen finished the feeder with some trim, contrasting coats of white paint and dark wood stain, and a sleek cabinet pull for quick access to the kibble stashed out of sight. And although your canine is sure to fall in puppy love with the appetizing outside of the station, one last detail on the inside makes this piece particularly fetching: A battery-powered LED light that automatically switches on when the door opens, and shuts off when it closes, making early morning and late night refills as easy as possible—for you and for Fido.